Here is a new utility in Windows 8 called RecImg. Its strategy is to rebuild your Windows 8 machine, but to keep all the data. This is rather like System Restore in previous Microsoft operating systems. The method I recommend is to run a built-in command called RecImg, which creates an install.wim file. Then refresh your Windows 8 machine via the Control Panel. I have also seen: 0x8007010b which is also an invalid directory. Solution: Create the directory before you run the command, in this case I made the directory called D:\Backup. Note 2: You could launch cmd.exe (Run as administrator) and then type the above command. 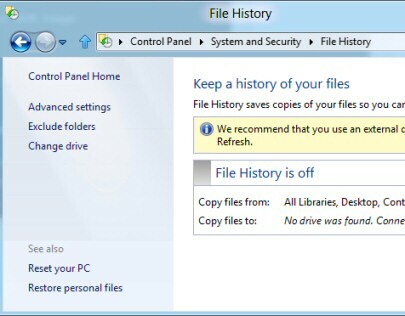 To refresh your Windows 8 machine launch the Control Panel, System, File History, Refresh your PC. 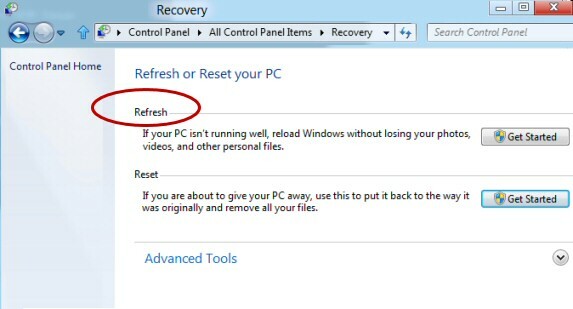 The ‘Reset’ feature removes all files and applications, its purpose is to create a clean install of the Windows 8 Operating System, what I suggest instead is the Refresh setting, because it preserves your data and settings. Note: Naturally you must have already created the image file called install.wim. The ideas is to start again with a fresh install of the operating system. However the improvement over System Restore is that Refresh keeps your Windows settings, and apps. The result that Windows 8 is working perfectly once more and none of your configuration settings or data are changed. This is how to create a system image in Windows 8. After the backup completes, it asks to create a system repair disc, click Yes. The purpose of Microsoft’s new feature for Windows 8 is to recover from a hard drive failure. The key command line executable called recimg. Remember that folder must exist before you create the image. Once you have succeed in creating an image, you can refresh via the Control Panel.